Education Minister Gideon Sa'ar was the top vote-getter in the Likud primary elections, which concluded with a clear wictory for the ruling party's right-wing branch. Polls closed at 10 pm Monday after two days of voting. A series of computer malfunctions at polling stations throughout the country on Sunday led to the extension of voting by a second day. Did hackers cause Likud primaries malfunction? The results indicate that the ruling party has shifted to the right, with moderates such as ministers Benny Begin and Dan Meridor failing to secure a realistic spot on Likud's list ahead of the general elections in January. The first 20 spots are considered realistic. Minister Gilad Erdan placed second in the primaries. He is followed by Silvan Shalom. Yisrael Katz, Danny Danon, Reuven Rivlin, Moshe Ya'alon, Zeev Elkin, and Tzipi Hotovely, the first woman on the list, were in the top 10. Yariv Levin, won the 11th spot on Likud's national list, followed by Minister Yuli Edelstein, and MKs Haim Katz and and Miri Regev. 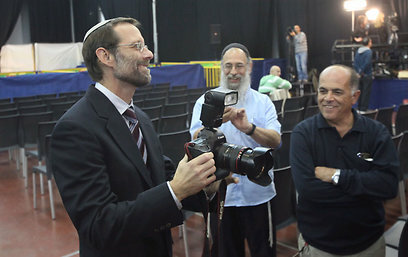 Moshe Feiglin, who heads the rightist Jewish Leadership faction of the Likud party, placed 15th in the primaries. He was followed by Yuval Steinitz, Tzachi Hanegbi, Limor Livnat, Ofir Akunis and Gila Gamliel. In addition to Begin and Meridor, ministers Avi Dichter and Michael Eitan also failed to gain a spot in the top 20. 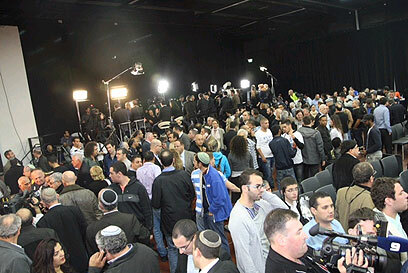 Prime Minister Netanyahu spoke to Likud supporters at Exhibition Grounds in Tel Aviv after the results of the party's primary elections were announced. "We have a strong national team; an experienced and talented team; a team that represents the entire nation. Today we proved again that the Likud is the people's party." Addressing ministers Meridor and Begin, Netanyahu said: "We grew up together in Jerusalem… educated by the values of Ze'ev Jabotinsky. I will maintain those values in the next government and I want you with me." Speaking to Ynet after the vote, MK Danon said "I respect all the people who found themselves off the list, but it's a generational thing. There is new blood in Likud's leadership." MK Hotovely told Ynet: "I deeply regret the fact that Benny Begin won't be in the party. I looked up to those people and learned from them." Adressing the results, Labor Chairwoman Shelly Yachimovich said, "The list chosen, accompanied by (Avigdor) Lieberman's extremists who will be part of it, makes the Likud a radical right-wing party." In late October Netanyahu and Lieberman announced they were uniting the Likud and Yisrael Beiteinu under one ticket ahead of the January elections. "We shall ask the public for a mandate to lead Israel with force. It will empower the government, it will empower the prime minister and therefore the state. I hope to win the public's trust again and to get a clear mandate that will allow me to focus on what is important," Netanyahu told reporters. Joining forces will give us the power to defend Israel and generate social and economic change," he added. The two refused to take questions, did not elaborate on the make-up of the new list and did not address the possibility of a rotation. Meretz Chairwoman Zahava Gal-On commented on the results of the Likud primaries, saying: "I see the Likud list and it makes me feel bad. We see how settlers have turned the Likud into a nationalistic, extremist rightwing list; how the liberal Likud has passed away today." "Centrist parties must make a commitment not to join Netanyahu, who will form a radical rightwing government," Gal-On told Ynet. The Yesh Atid Party, chaired by Yair Lapid, stated that "The Likud has presented a worrying list that revolves around 'old politics' deals and ideological extremism." "This is no longer the Likud of Menachem Begin and national politics; whoever votes for the Likud-Beiteinu list will get a branch of the National Union Party," the Yesh Atid statement read. 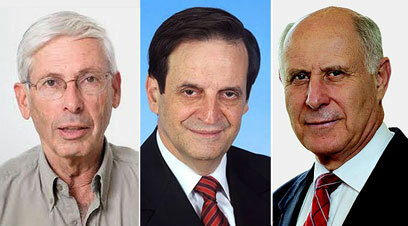 See all talkbacks "Likud primaries: Feiglin in, Begin and Meridor out"